Ron Mueck's "Untitled (Big Man)" is part of the exhibit curated by Shaq at FLAG, starting Friday. Kicking off Friday at Chelsea’s FLAG Art Foundation is Size DOES Matter, a collection of 66 works of art across different media, aimed at highlighting how scale affects perception. So who better to tap for curating the show than 7-foot-1 Cleveland Cavalier center and art collector Shaquille O’Neal, who wears a size 22 shoe? 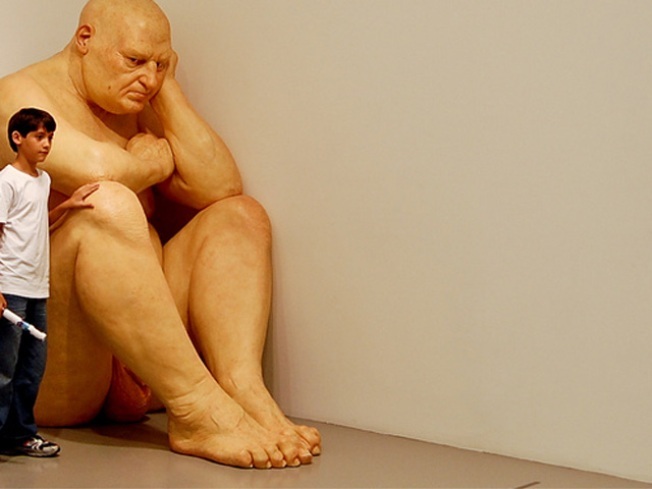 Included in the show, according to the Post, are pieces like “Robert Therrien's colossal sculpture of a table and six chairs” and “Ron Mueck's ‘Untitled (Big Man),’ a nearly 7-foot-tall sculpture of a naked, bald man curled up awkwardly, elbows resting on his knees” (pictured). There are also a few works that take O’Neal himself as the subject, such as Willard Wigan’s portrait of the player that’s so tiny, it fits in the eye of a needle. The exhibition – whose catalogue includes an essay by Cleveland native/author/Oprah whipping boy James Frey – runs February 19 through May 27, 2010.